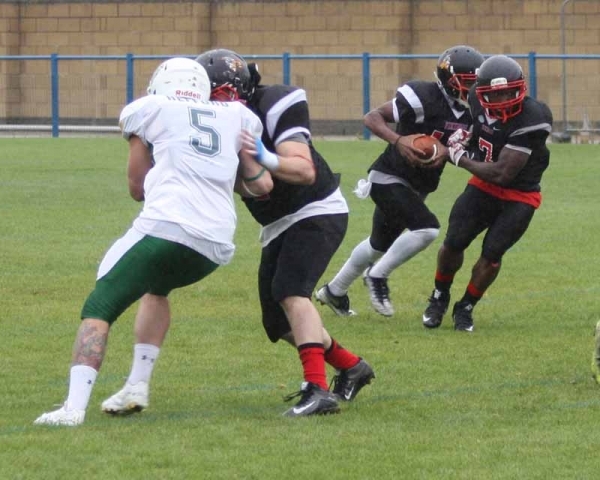 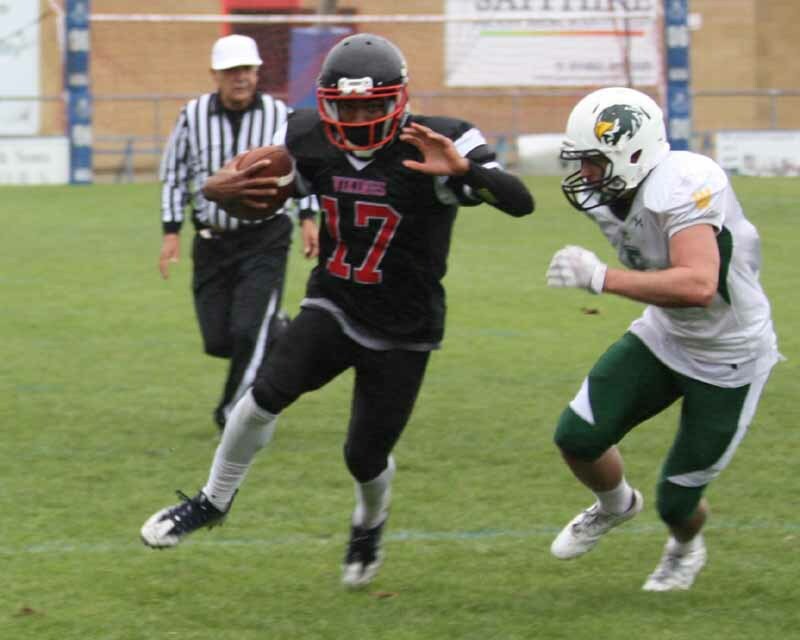 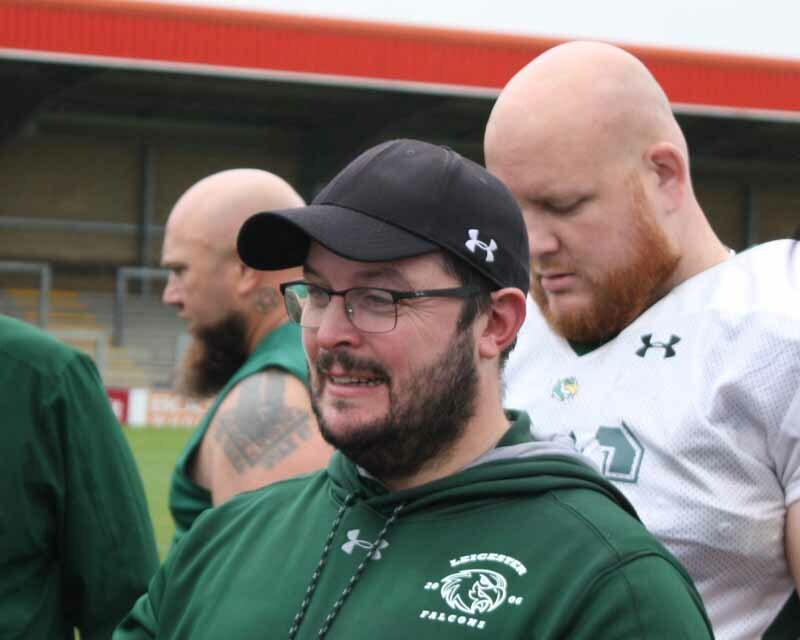 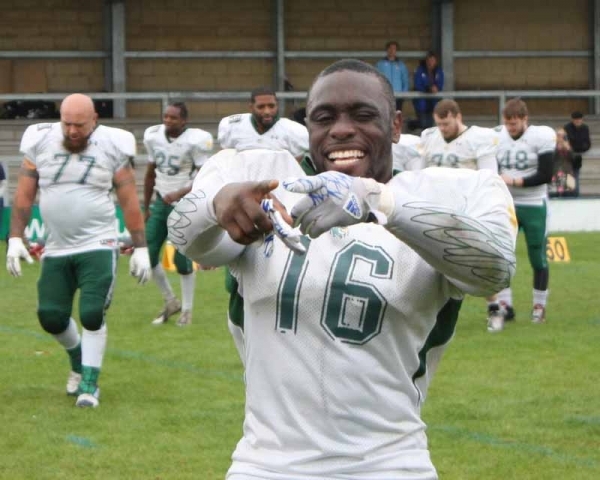 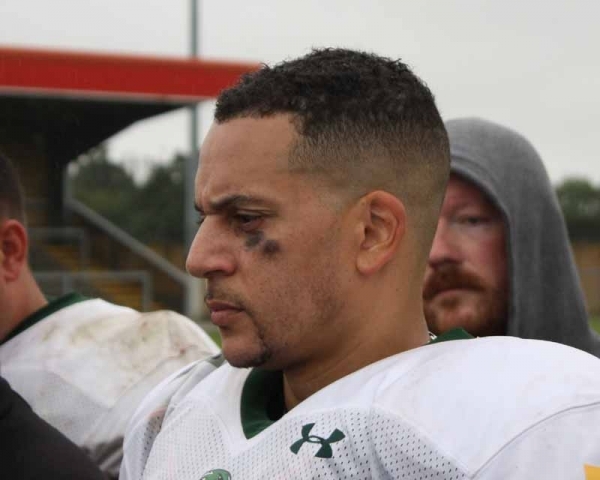 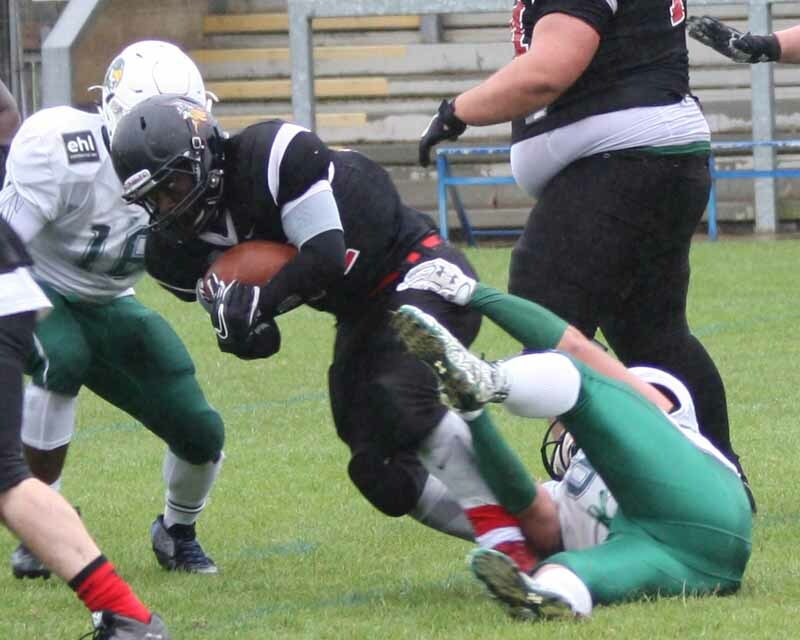 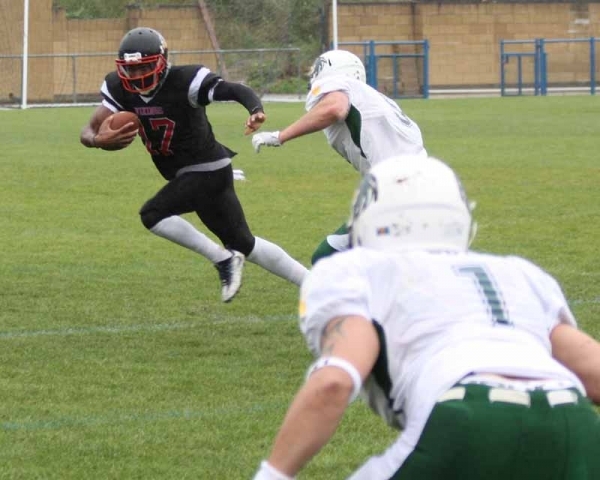 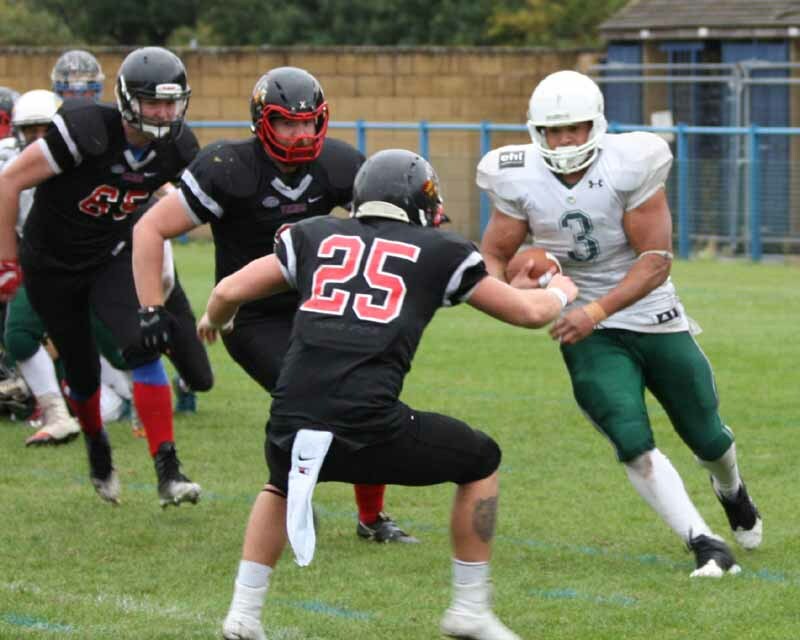 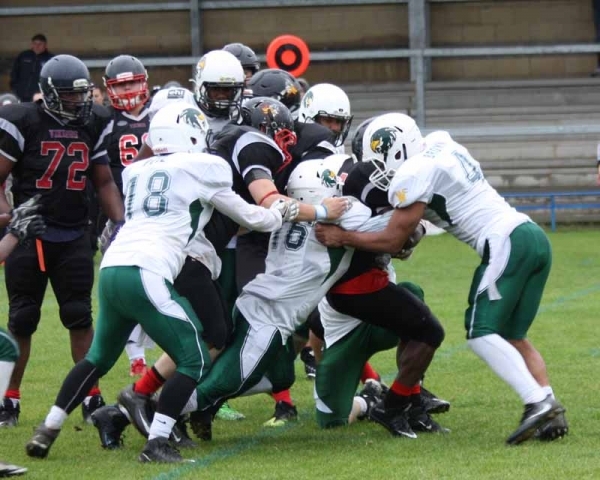 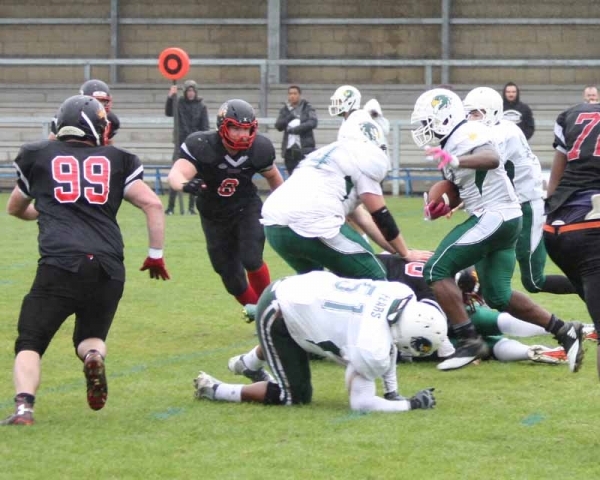 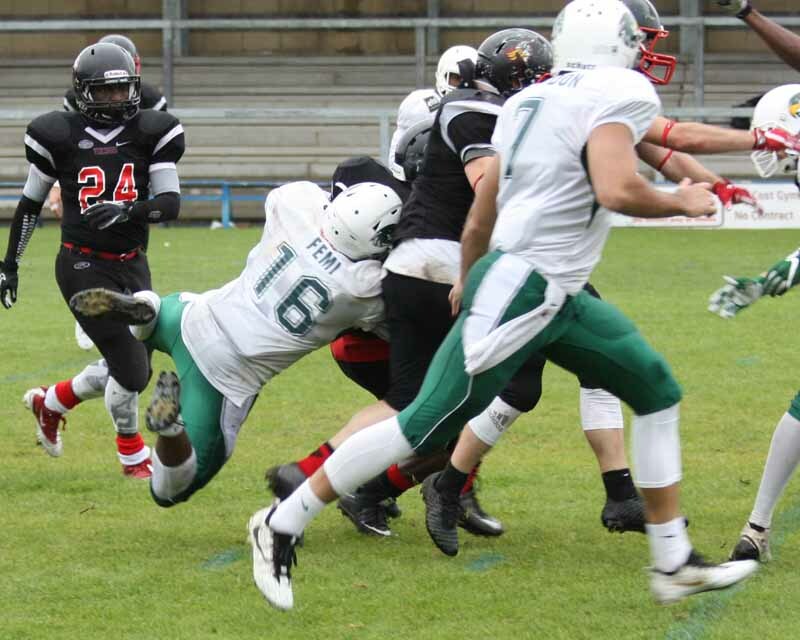 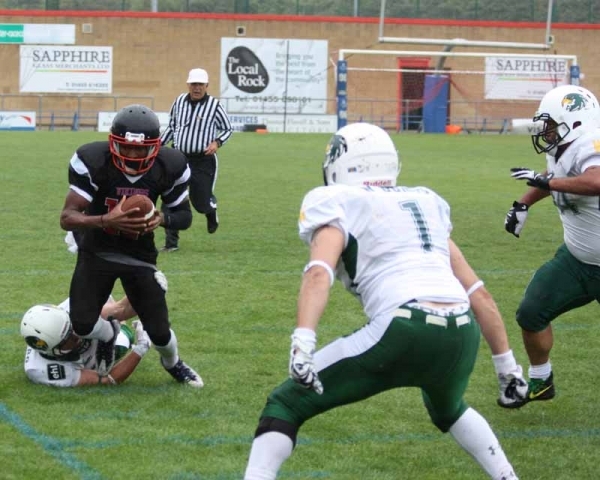 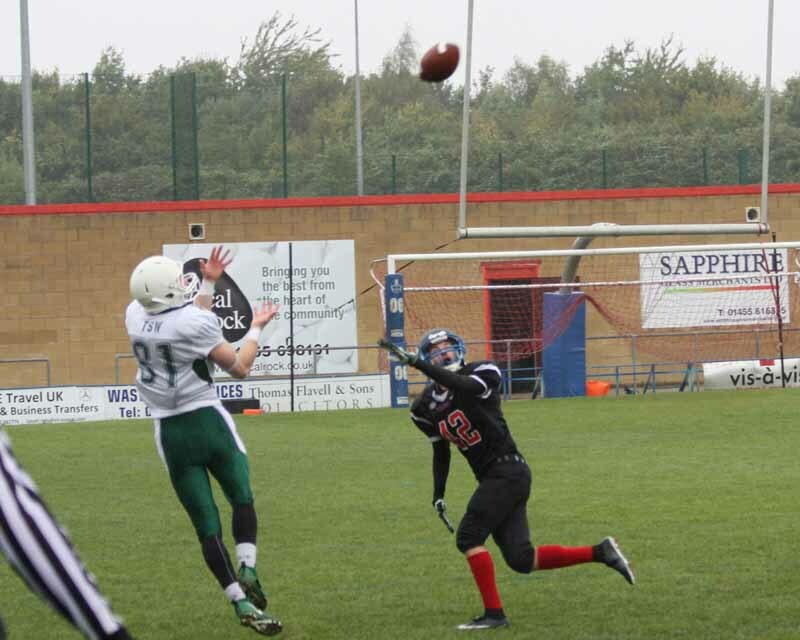 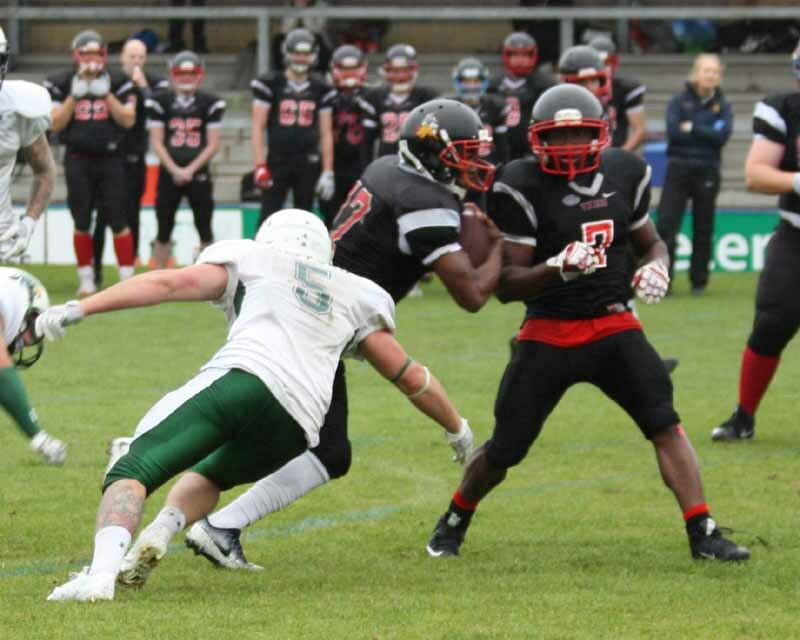 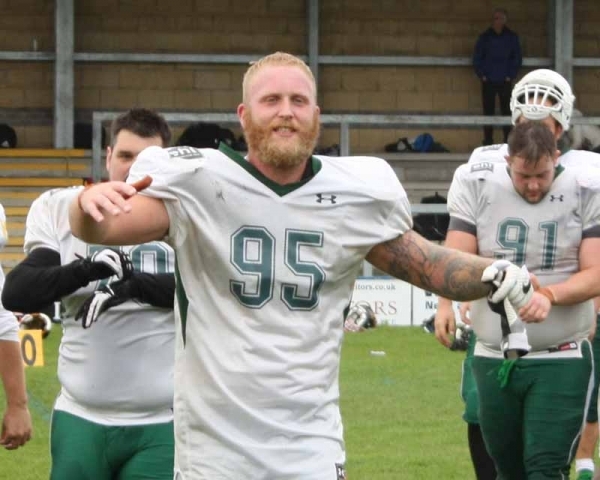 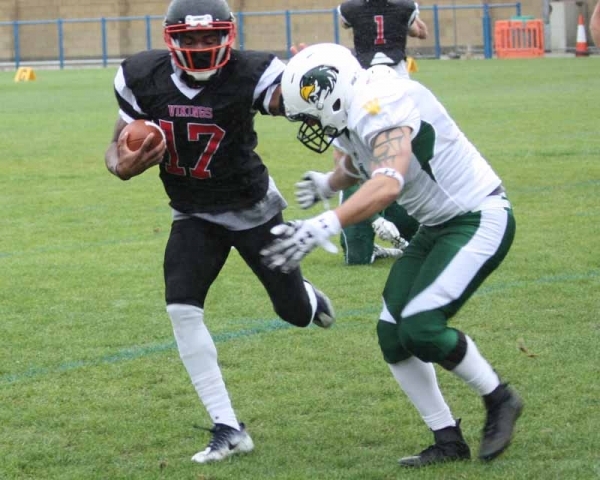 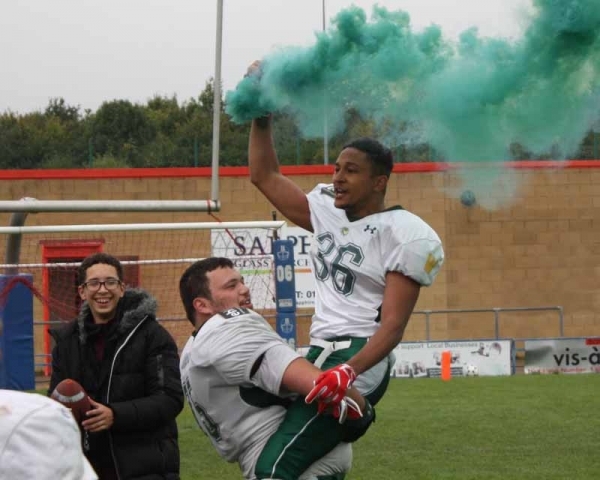 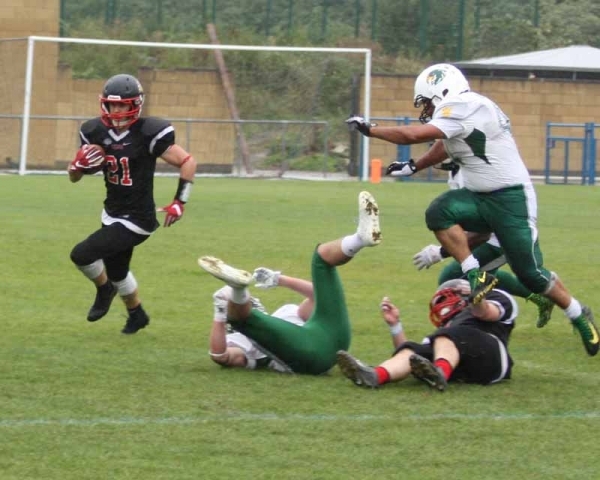 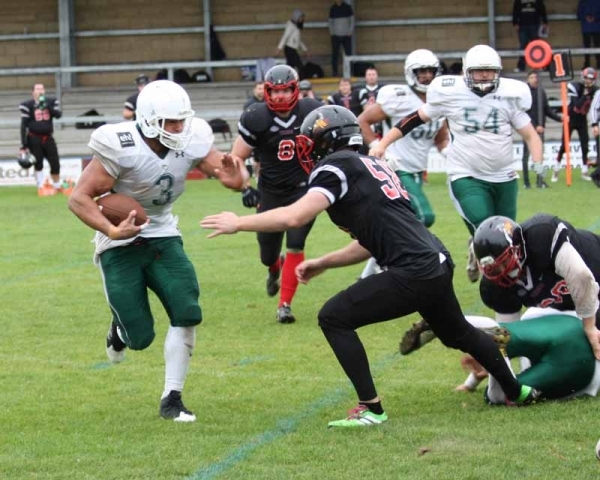 Leicester Falcons will play Premier Division football next season for only the second time in their history after a thrilling 15-8 victory over Northumberland Vikings on Sunday at Leicester Road. 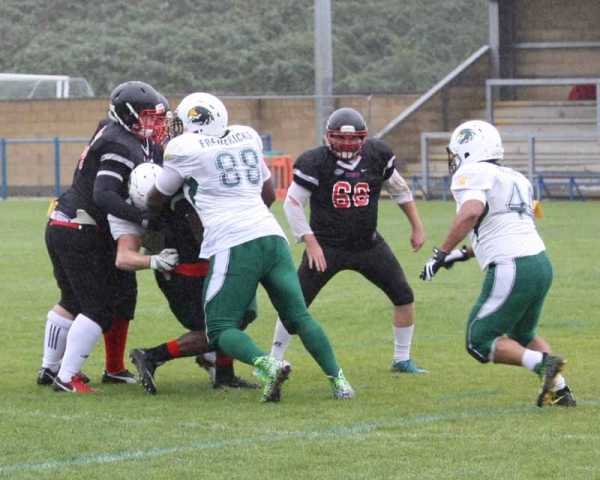 The Newcastle side outgained the Falcons in terms of offensive yards but the defence made several key goal line stands to ensure victory. The Falcons begun brightly, moving the ball downfield, but Marcus Francis had the ball ripped from his grasp as Leicester moved into scoring position. 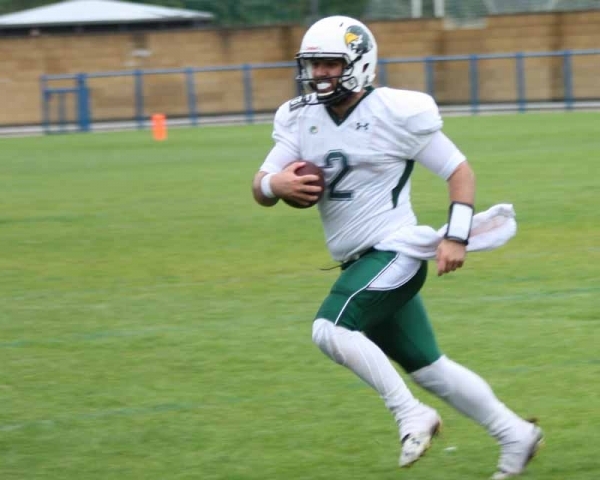 They made up for it on their second possession however, with quarterback Joe Brammer finding first Thomas Singleton-Wells for a big gain, then Alex Preece in the corner of the end zone for the touchdown from 14 yards. 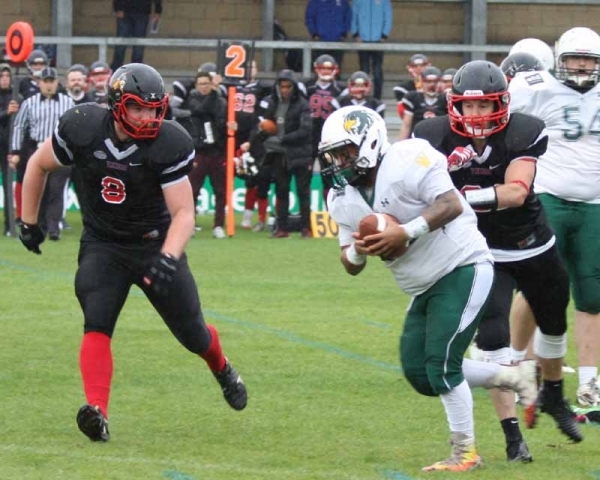 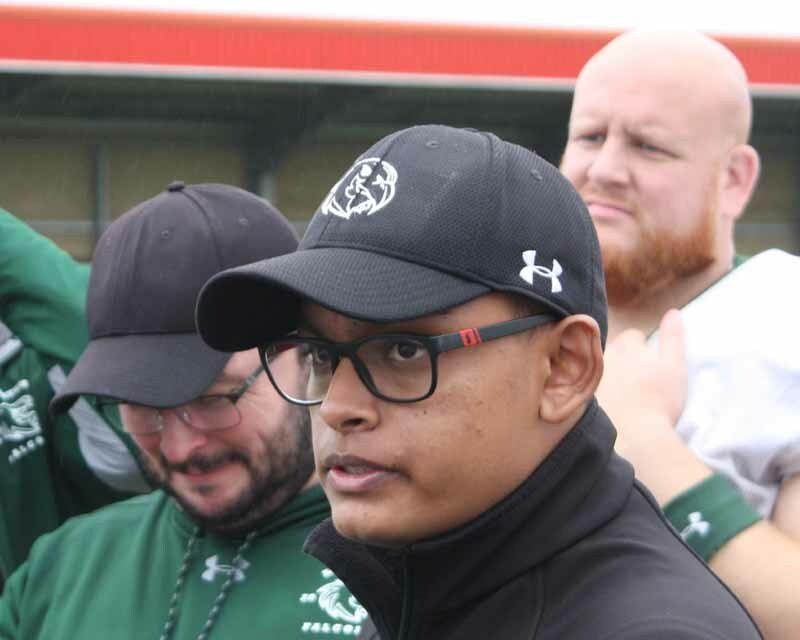 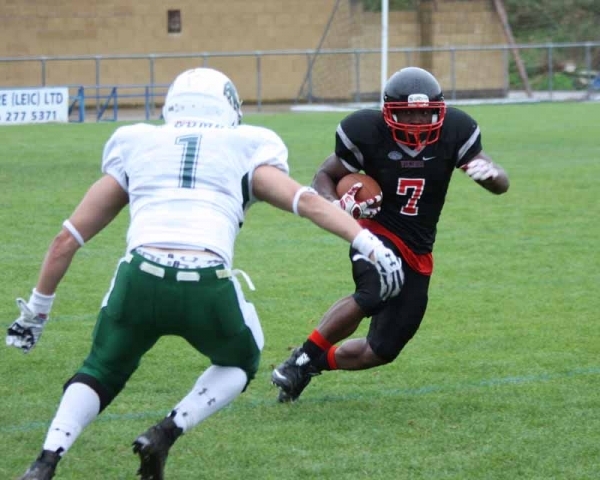 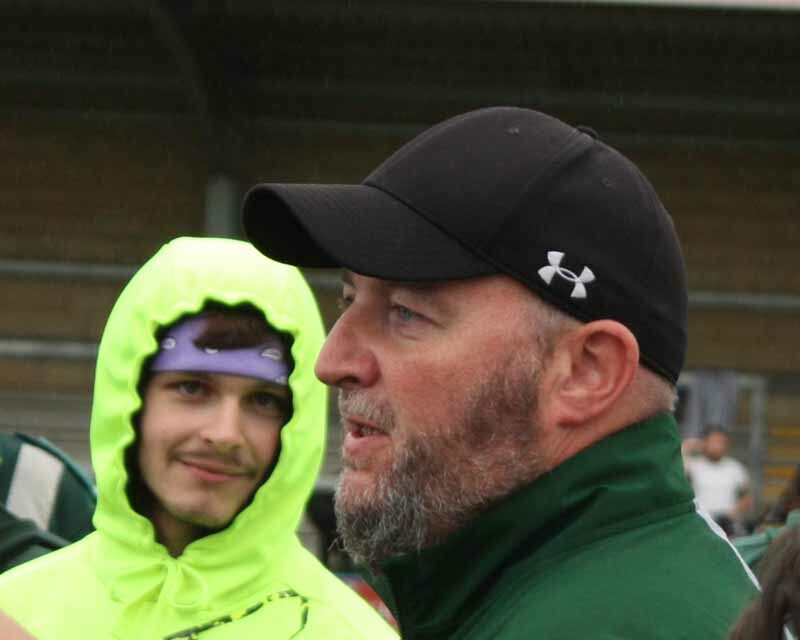 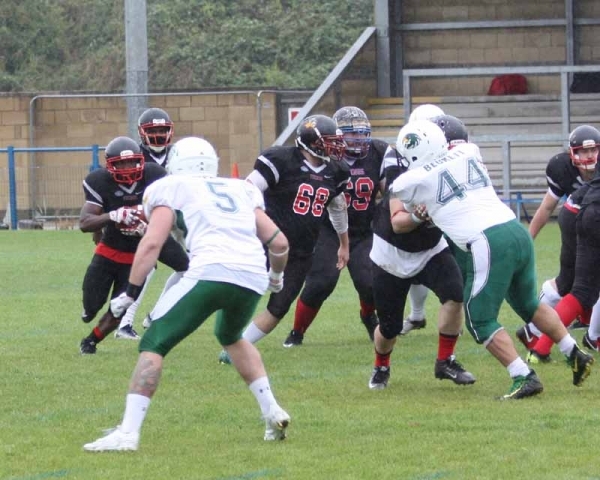 The Vikings offence responded by moving the ball well, utilising an effective read-option offence with quarterback Eric Poindexter and running back Jonny Mbuyi, but were held inside 30 yards after choosing to keep the offence on the field on fourth down. 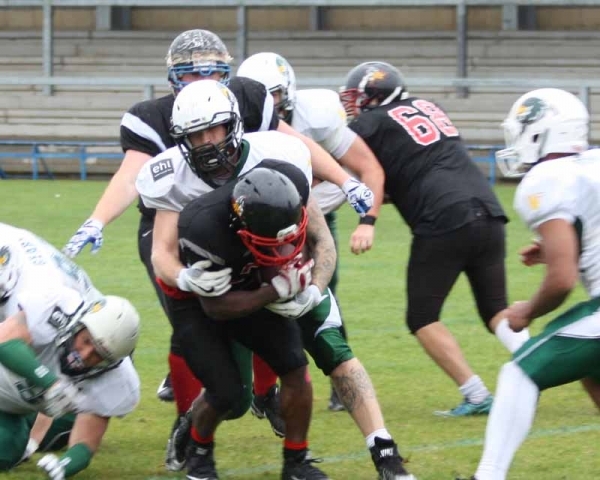 After penalties moved the Falcons out of scoring position on their next possession, the Vikings drove long downfield to end the half, but were stopped at the five yard line thanks to a spirited goal line stand from linebackers Bill Hefford and Michael Freauff. 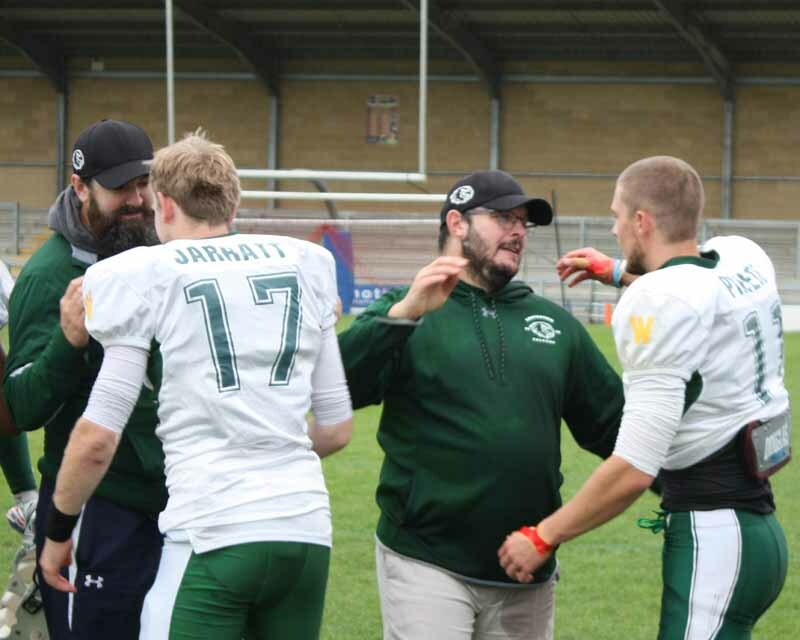 The second half again saw the Vikings put together a long drive based around Poindexter’s read option, and it required GB international Jamaal Fredricks to come up big with a fourth down sack. 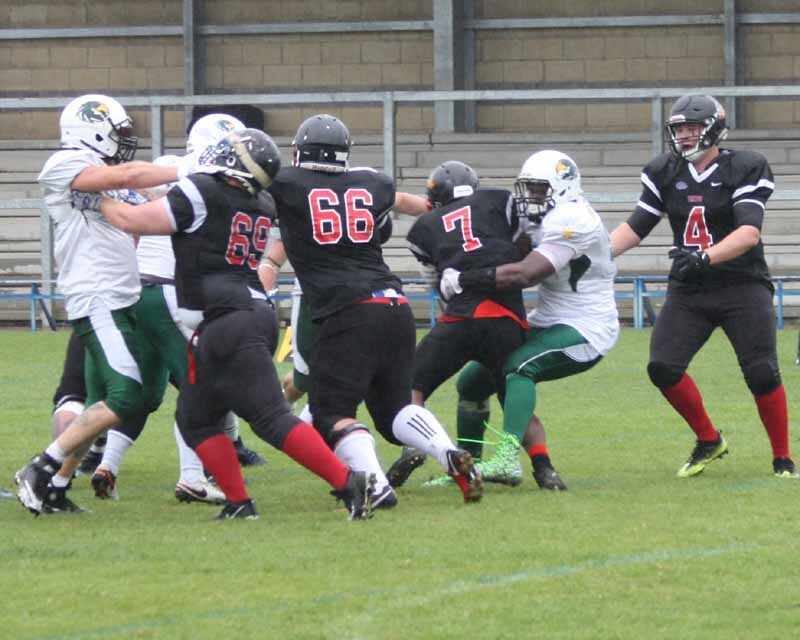 After Brammer was intercepted by Vikings linebacker Jerome Klien, Northumberland again got into scoring position but were pushed back by a holding penalty and the Falcons were let off. 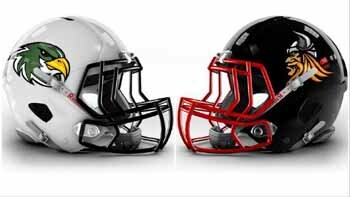 A Vikings score began to look inevitable and finally came from a quick pass from Poindexter to Conor Joyce, who added a 2-point conversion to give Northumberland the lead with just minutes remaining. 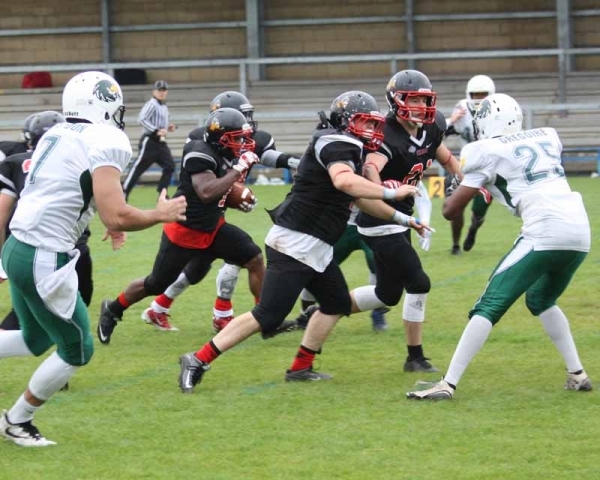 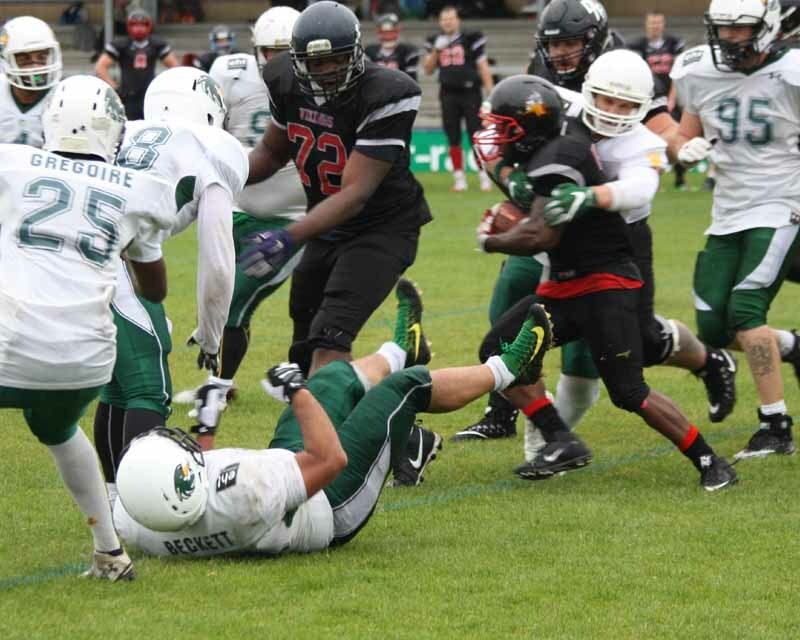 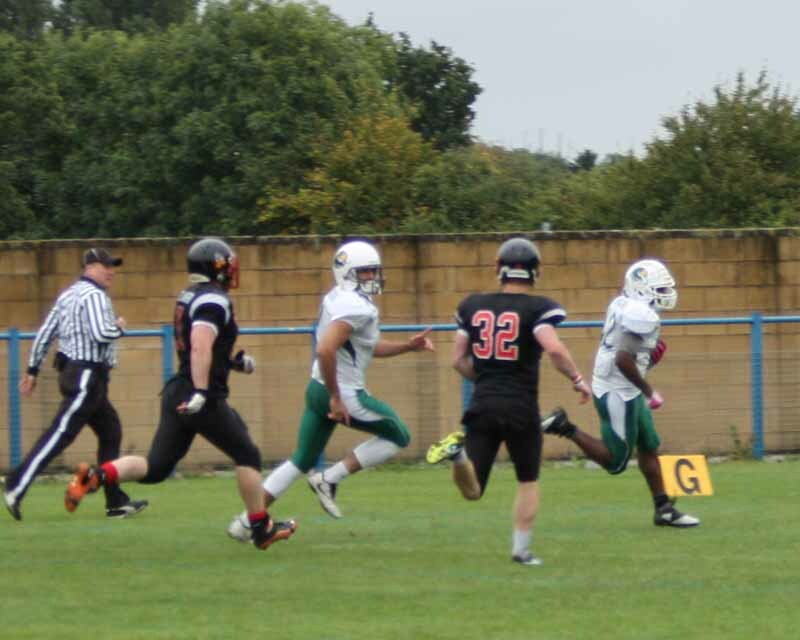 The Falcons needed a big play on offence and it finally came through running back Tolu Ogundana, who broke away for a 35 yard score, and Leicester regained the lead. 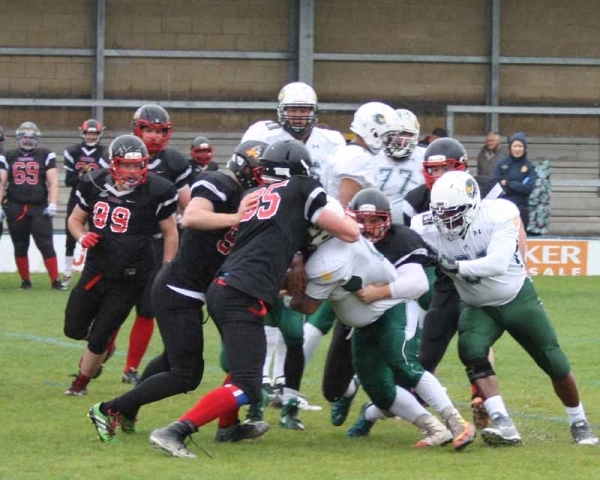 There was time on the clock for one last Vikings drive, who again moved the ball but a crucial fourth down pass deflection from Joel Gregoire ended the drive and gave the Falcons victory. 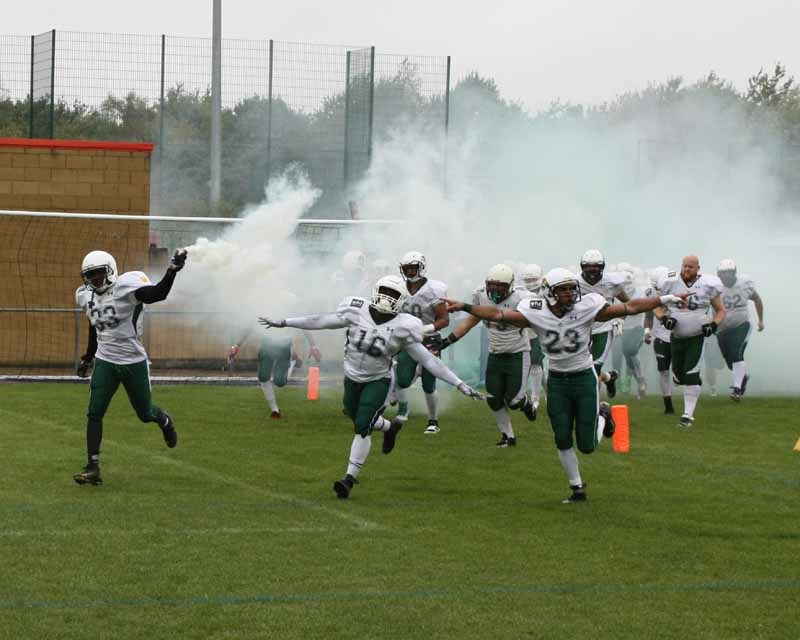 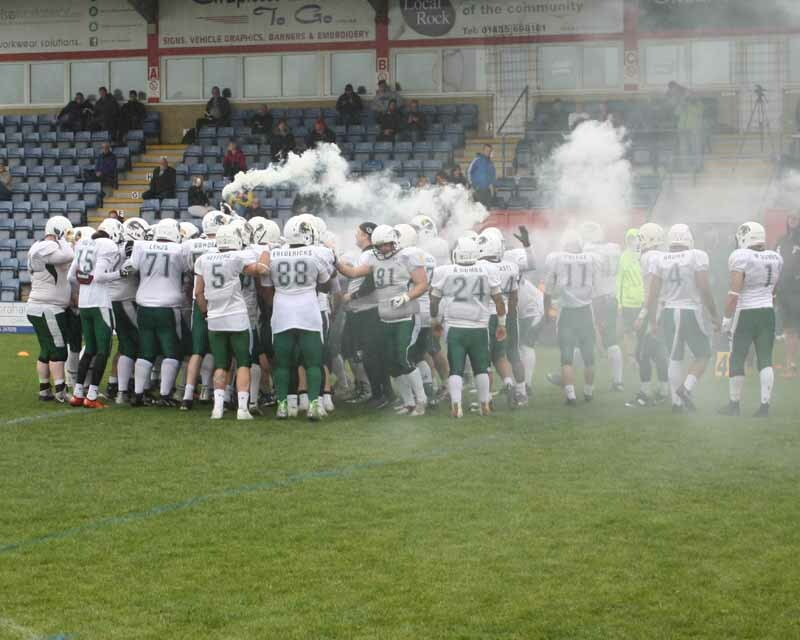 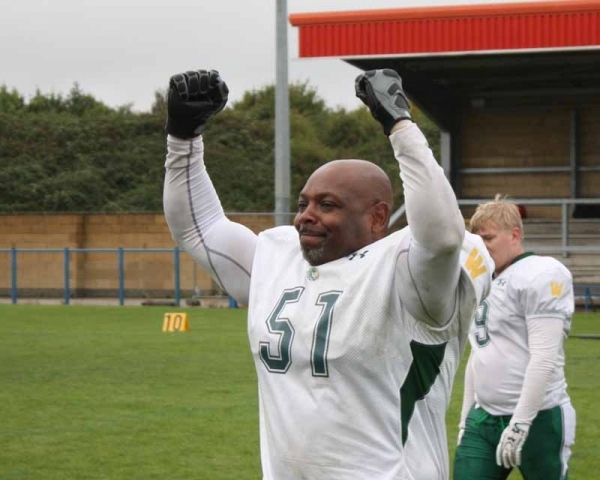 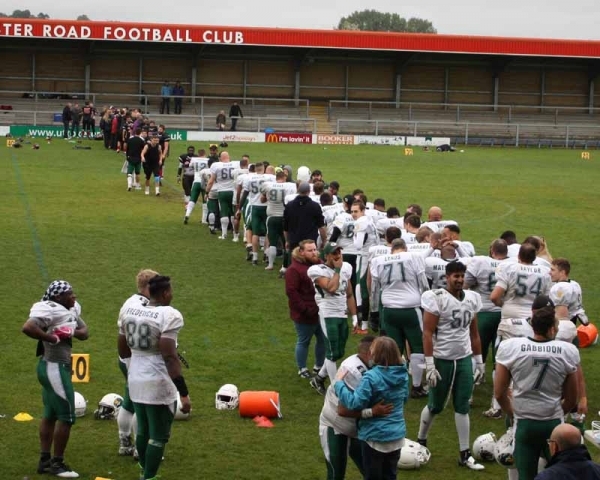 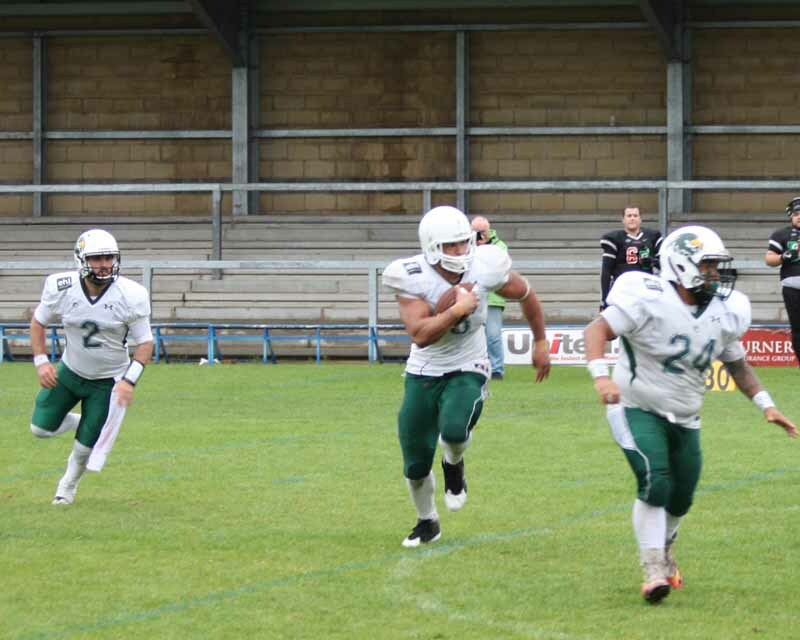 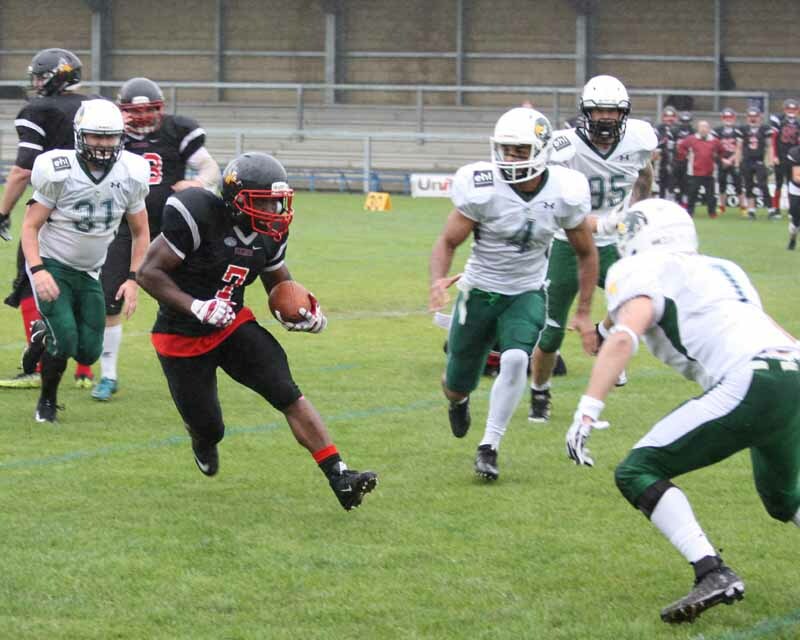 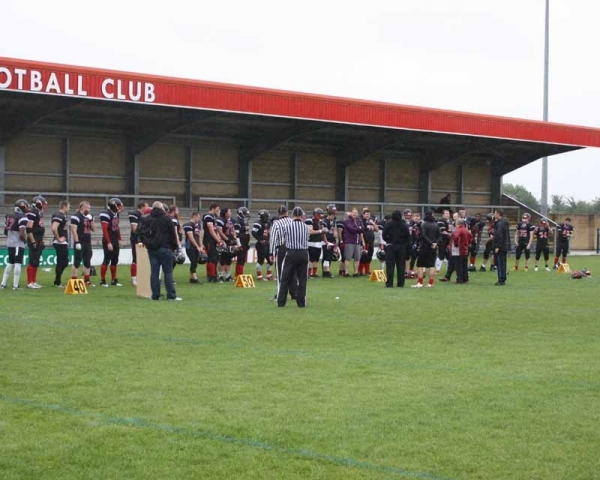 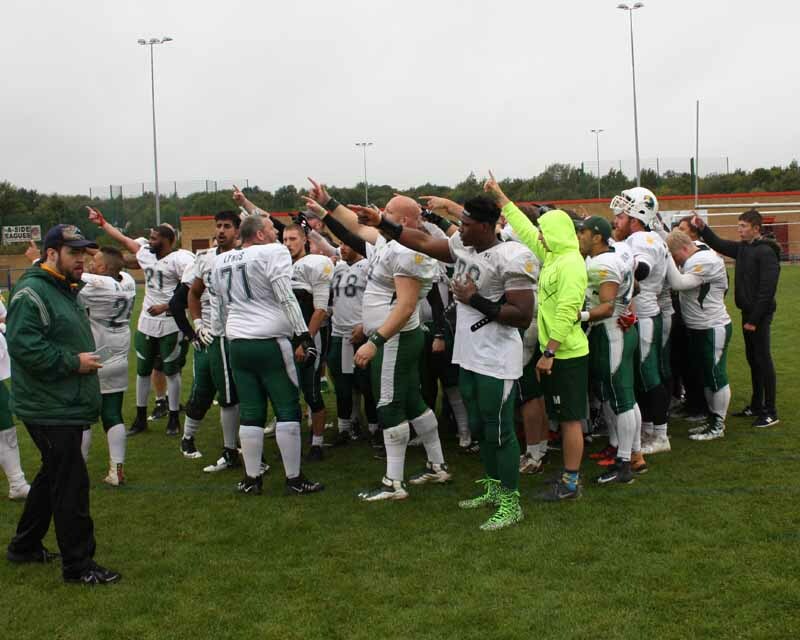 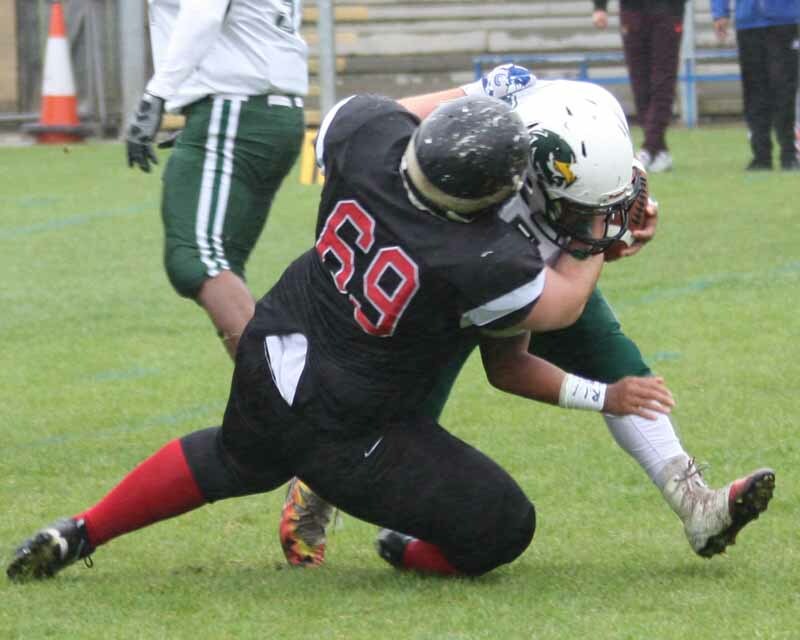 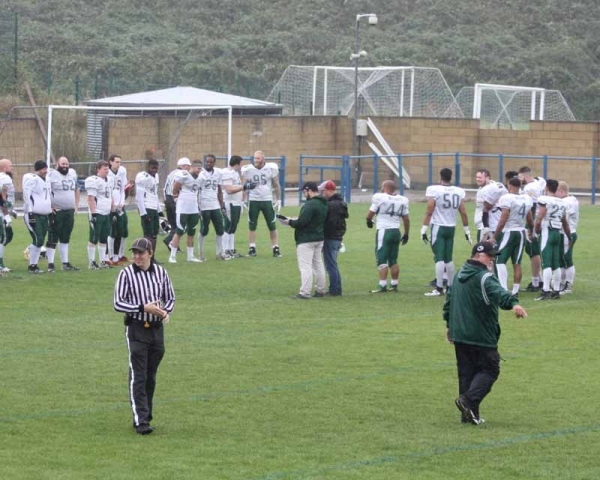 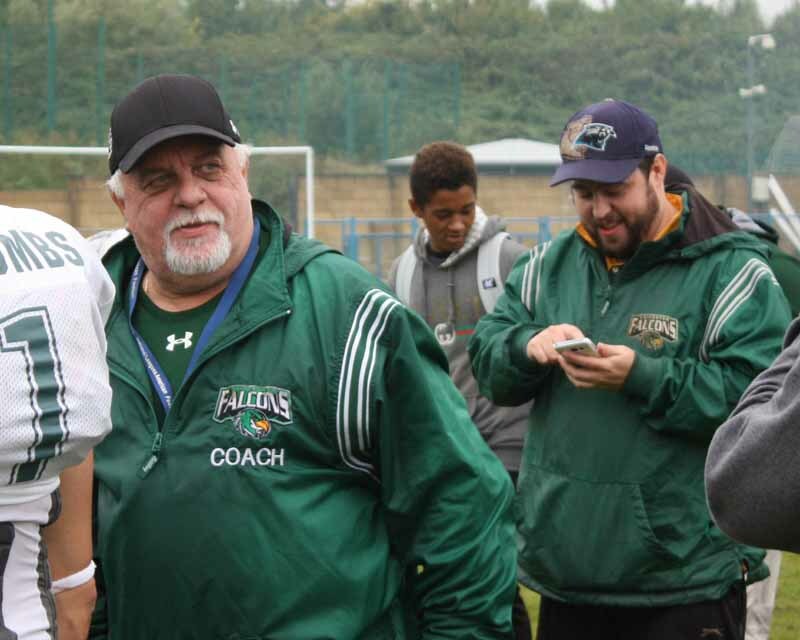 The Falcons will now travel to Leeds in two weeks for their final game of the season in the Division 1 Championship game, against Division 1 South champions Kent Exiles.